Put 1 piece of wax paper on the plate. Peel the bananas. Use the table knife to cut each banana into 5 chunks on the cutting board. Put the banana chunks, cut side down, on the waxed paper-lined plate. Stick a toothpick into each banana chunk. Put the plate in the freezer for about 20 minutes or until the banana chunks are hard. While the banana chunks are freezing, measure out the candy sprinkles. Put them in the custard cup. Set them aside for later. Measure out the chocolate chips. Toss them into the bowl. Microwave the chips on High 60 to 90 seconds, until they are melted. Stir the chocolate chips with the spoon until they are smooth. Measure out the frosting. Use the rubber spatula to scrape all of it out of the measuring cup and into the bowl with the melted chips. Mix it all up with the spoon. Microwave the mixture on High 15 to 20 seconds, until the mixture looks like a dip. Remove the banana chunks from the freezer. Dip each banana chunk into the melted chocolate mixture. Spoon some chocolate onto the sides of each chunk. Sprinkle the banana chunks with the candy sprinkles from the cup you set aside earlier. When you are finished putting the sprinkles on the banana chunks, put them back on the waxed paper-lined plate. 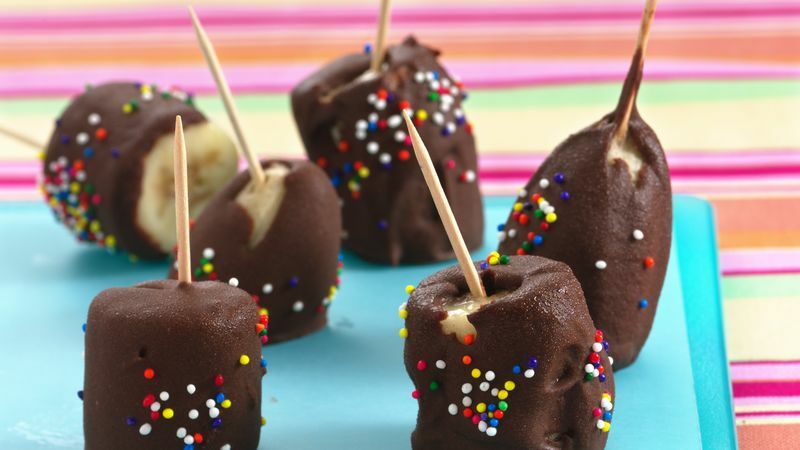 Put the dipped banana chunks in the freezer for 1 hour or until the chocolate and bananas are hard. Eat the banana chunks right out of the freezer. If the chocolate chip and frosting mixture starts to get hard, microwave it on High 5 to 10 seconds, until it gets soft again.